To Cite: Aghaei Moghadam E, Ghamari A, Majnoon M . Widespread Valvular and Vascular Calcification in Type III Gaucher Disease, Iran J Pediatr. Online ahead of Print ; 29(1):e5826. doi: 10.5812/ijp.5826. A 13-year-old girl, as a known case of type III Gaucher disease, was referred to us for a cardiac assessment. Our investigations revealed wall thickening and calcification in the ascending thoracic aorta, transverse arch, and isthmus. Calcification was also present in the proximal portion of the brachiocephalic trunk while the osteal narrowing of right common carotid was also notable. The other finding included isolated thrombocytopenia. We decided to perform surgery after two months of enzyme replacement therapy. Gaucher disease is the most common lysosomal storage disease caused by an autosomal recessive inherited defect of the lysosomal enzyme glucocerebrosidase. Cardiac involvement such as the aorta, mitral valve, or tricuspid valve calcification is seen in a variant of type III calcification (1-3). 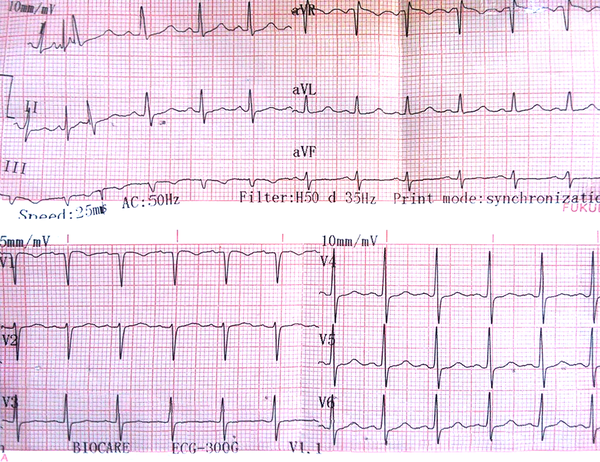 This case report presents diffuse and severe cardiac involvement. A 13-year-old girl, as a known case of type III Gaucher disease, was referred to us for the cardiac evaluation. She was the only child of consanguineous parents after a normal pregnancy and delivery. There was not any other case of Gaucher disease in their family history. Her past medical history was significant for the episodes of the seizures in the first two years of life and isolated thrombocytopenia. Phenobarbital was administered due to her seizures in the first two years of life but it did not continue because of the resolving of the seizures. The only medication she was using was a daily multivitamin. Her platelet count was 30000/mm3 but her hemoglobin and white blood cells were within the normal range. The patient did not state any history of gum bleeding, nosebleeds, excessive bleeding from her wounds, and easy bruising but she had abnormal urethral bleeding. The patient had no complaint of chest pain, syncope, and dyspnea and she had an acceptable neurodevelopmental situation. The patient weighed 40 kg and her height was 144 cm. Her heart rate was 78 bpm and her blood pressure was 110/60 mmHg. The extremities were thin and were not cyanotic and oxygen saturation was 96%. The peripheral pulses were stronger than normal but not in the pathologic range. Her cardiac auscultation revealed normal first cardiac sound but loud second cardiac sound. A 3/6 systolic ejection murmur was audible in the aortic area that radiated to carotid arteries and a 3/6 pansystolic murmur was audible in the apex that radiated to the axilla. During her abdominal examination, we found liver palpable 3 cm below the right costal margin and spleen 2 cm below the left costal margin. Her ophthalmologic examination showed strabismus, astigmatism, and myopia but in both eyes, the transparency of crystalline lens was normal and also the fundus examination and cornea were normal. Except for an oculomotor apraxia and ataxic gate, the other neurological examinations, electroencephalography, and caudal MRI were normal, as well. The lipid profile was normal. Her electrocardiogram revealed normal sinus rhythm, left atrial enlargement, left axis deviation, and non-specific ST and T wave changes (Figure 1). Her echocardiography showed moderate supravalvular aortic stenosis with the mean pressure gradient of 18 mmHg and peak pressure gradient of 52 mmHg, mild thickening of tricuspid and mitral valve leaflets and left ventricle hypertrophy (Figure 2). 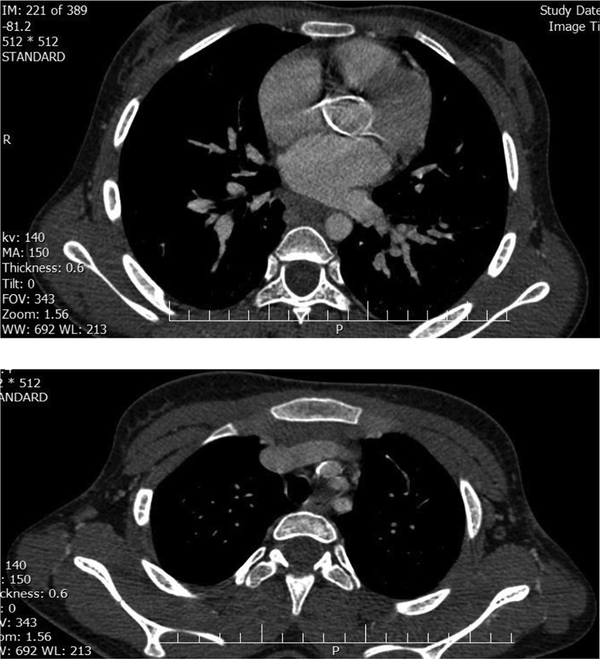 CT angiogram was performed to evaluate the situation more precisely and it demonstrated multiple abnormalities: Wall thickening and calcification were found in the ascending thoracic aorta (called as porcelain aorta), transverse arch, and isthmus. Calcification was also present in the proximal portion of the brachiocephalic trunk and osteal narrowing of right common carotid was also notable (Figure 3). With the consultation of the endocrine department, we decided to perform the surgery following the administration of Cerezyme 60 units/kg every two weeks after two months. She is still in the waiting list for surgical repair. Gaucher disease is the most common lysosomal storage disease caused by an autosomal recessive inherited defect of the lysosomal enzyme glucocerebrosidase. Glucocerebroside accumulation in the reticuloendothelial system occurs as a result of this defect (4). The disease is classified into three types: Type 1, which is the most common type, is differentiated from other types by the absence of primary central nervous system involvement. Type 2 is the most severe type and the signs associated with the central nervous system involvement are presented in the first two years of life and has a survival of two years. Type 3 has a later onset of neurological manifestations and a more chronic course (4). A variant of type III known as type IIIC is manifested by cardiac involvement such as the aorta, mitral valve, or tricuspid valve calcification (1-3). Previous reports of cardiac involvement in Gaucher disease have been rare and include constrictive pericarditis, pericardial calcification, various valvular lesions, and diffuse infiltration of the myocardium by Gaucher cells (4, 5). In 1995, Altunbas et al. reported a 17-year-old patient, as the case of type III Gaucher disease with calcified aortic and mitral valve stenosis, calcified ascending aorta, arcus, and abdominal aorta. Their patient died because of a cardiogenic shock following an emotional stress. They recommended performing the surgery as soon as possible in the patients with severe valvular disease (6). Samuel et al. presented a 13-year-old girl with the complaint of chest pain that in further investigations, demonstrated thickened, myxomatous mitral and tricuspid valves and a thrombocytopenia of unclear etiology, leading finally to the diagnosis of Gaucher disease type III. Just after the performance of cardiac surgery, their patient bled massively and at the post-operation, recurrent subdural hematoma and small intraventricular hemorrhage occurred but fortunately, they succeed to manage the complications. In the end, they gave useful recommendations: In young adults with abnormal valvular calcification, we would better keep Gaucher disease in mind, the surgical team should be prepared for post-operative excessive bleeding in the known cases of Gaucher disease and if the surgery is elective, it is the best to initiate enzyme replacement therapy as soon as possible and perform a hematological workup before the surgery (7). These recommendations were very instructive for us because our patient had also abnormal platelet counts; therefore, she was prone to the post-operative excessive bleeding and complications. As the patient was asymptomatic and the cardiac surgery was not urgent, we preferred to postpone the surgery after the administration of enzyme replacement therapy and correcting the hematological situation as much as possible. In 1999, Schmuel et al. performed research on 32 patients to find out whether the platelet function could explain the bleeding manifestation or not and finally, they concluded that platelet function tests are better to be performed on all non-splenectomized Gaucher patients, not receiving enzyme replacement therapy prior to surgical procedures, or with an unexplained bleeding disorder (8). In our case, the cardiac involvement was more diffuse and severe than the most of the previously reported cases. A study was done by Altarescu et al. on 21 patients with the type III Gaucher disease for assessing the efficacy of enzyme replacement therapy in each different manifestation of the disease. Finally, they saw a significant improvement in hemoglobin levels, platelet count, and acid phosphatase values, a decrease in hepatosplenomegaly, and an improvement in the bone structure. They concluded that enzyme replacement therapy could reverse all systemic manifestations of the disease and prevent deterioration of neurological manifestations in most patients (9). 1. George R, McMahon J, Lytle B, Clark B, Lichtin A. Severe valvular and aortic arch calcification in a patient with Gaucher's disease homozygous for the D409H mutation. Clin Genet. 2001;59(5):360-3. [PubMed: 11359469]. 2. Shah S, Misri A, Bhat M, Maheshwari S. Gaucher's disease type III C: Unusual cause of intracardiac calcification. Ann Pediatr Cardiol. 2008;1(2):144-6. doi: 10.4103/0974-2069.43883. [PubMed: 20300259]. [PubMed Central: PMC2840747]. 3. Chabas A, Cormand B, Grinberg D, Burguera JM, Balcells S, Merino JL, et al. Unusual expression of Gaucher's disease: Cardiovascular calcifications in three sibs homozygous for the D409H mutation. J Med Genet. 1995;32(9):740-2. [PubMed: 8544197]. [PubMed Central: PMC1051678]. 4. Beutler E. Glucosylceramide lipidoses. In: Scriver CR, Sly WS, editors. . 7th ed. New York: McGraw-Hill; 1995. 5. Abrahamov A, Elstein D, Gross-Tsur V, Farber B, Glaser Y, Hadas-Halpern I, et al. Gaucher's disease variant characterised by progressive calcification of heart valves and unique genotype. Lancet. 1995;346(8981):1000-3. [PubMed: 7475546]. 6. Altunbas G, Ercan S, Inanc IH, Ozer O, Kervancioglu S, Davutoglu V. Extensive vascular and valvular involvement in Gaucher disease. Asian Cardiovasc Thorac Ann. 2015;23(4):446-8. doi: 10.1177/0218492313513598. [PubMed: 24887908]. 7. Mireles SA, Seybold J, Williams G. Undiagnosed type IIIc Gaucher disease in a child with aortic and mitral valve calcification: Perioperative complications after cardiac surgery. J Cardiothorac Vasc Anesth. 2010;24(3):471-4. doi: 10.1053/j.jvca.2009.05.006. [PubMed: 19632857]. 8. Gillis S, Hyam E, Abrahamov A, Elstein D, Zimran A. Platelet function abnormalities in Gaucher disease patients. Am J Hematol. 1999;61(2):103-6. [PubMed: 10367788]. 9. Altarescu G, Hill S, Wiggs E, Jeffries N, Kreps C, Parker CC, et al. The efficacy of enzyme replacement therapy in patients with chronic neuronopathic Gaucher's disease. J Pediatr. 2001;138(4):539-47. [PubMed: 11295718].